Profi International Tractors and Farm Machinery Profi International Tractors and Farm Machinery is a magazine that has been dedicated to comparing, scientifically testing, advising and comparing facts about tractors and farming machinery. Profi International Tractors and Farm Machinery is a magazine that has been dedicated to comparing, scientifically testing, advising and comparing facts about tractors and farming machinery. It is accepted normally that the awareness about using farming machinery and modern tools is very low. Hence, this magazine ensures imparting knowledge and understanding of mechanized farming to its readers. It is a common observation that the huge numbers of innovative techniques, as well as mechanized farming techniques that are introduced somehow, do not get conveyed to the right person at the right time. Owing to the advertisements of tractors, the models seem a little known among the appropriate crowd, but they usually fail miserably at differentiating one from the other through the aspect of technical specification. Thus, in this magazine, you would keep getting informed about all that is required to know about tractors and farming machinery. The articles featured in the issues also help in getting more by altering the ways in which the present machinery is used. Lack of awareness has always jeopardized this mechanized farming aspect forever. 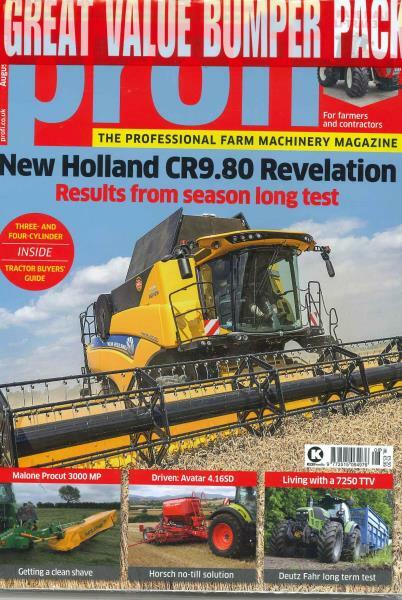 Now, the decision of subscribing to the Profi International Tractors and Farm Machinery magazine seems to be a considerable measure to come out of that. A subscription to the Profi International Tractors and Farm Machinery magazine entitles you to 11 issues that come out every year. There is one issue every month except for the fact that the Issues of July and August are combined. The articles in Profi International Tractors and Farm Machinery magazine open you to the wealth that lies in the technical and practical approaches that ensure optimal production. Not just new, the magazine also advises you about what kinds of used equipments you might want to buy and all that you need to look in it, before you decide to buy it. The magazine has a readership of more than 20 thousand.